Between endless emails, newsletters, and social media posts flowing in and out of your office, it’s easy to forget the warm, fuzzy feeling of receive a holiday greeting in the mail. While digital greetings are incredibly easy to plan, design, and send out, there’s nothing quite like the impact of a physical card or gift to remind your clients that you truly care. If you’re looking to send a card to your contact list this holiday season, make sure it feels personal. After all, the reason for sending a physical greeting is to make sure that the gesture does not feel automated and generic. Whether you choose to send only a few or many holiday greetings, there are plenty of ways have your message feel personalized. If your team is small enough, be sure to include the names of each employee. This shows that there is always a team of people working to support a client’s initiatives. Have a larger team? Adding photos of your team gives clients a chance to put a name to a face and get a behind-the-scenes look into your team and they space they work in. For valued clients and customers, try including a personal hand-written message on a card. Let them know that you are grateful for their business in the past, and appreciate them as a client. Taking the time to write personalized messages to these clients will leave a lasting impression and may even spark up a conversation of new projects in the upcoming year. 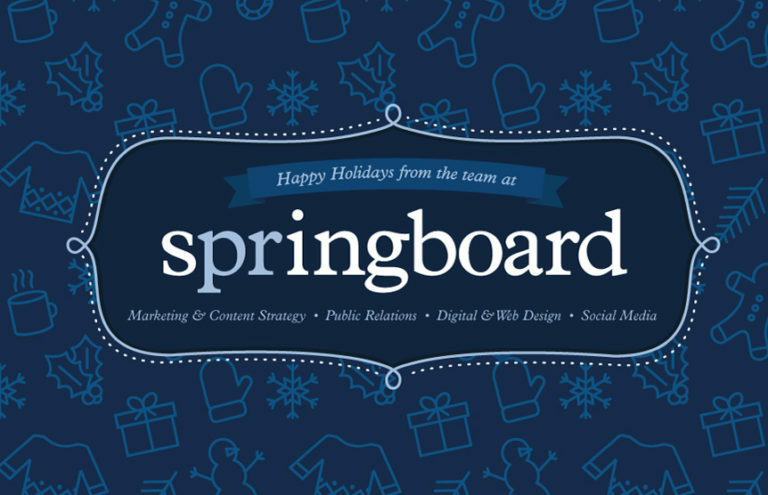 If you’re planning to send a holiday greeting this season, be sure that it feels on brand with your business. This doesn’t imply that you need to highlight your company logo on the card, but instead give the impression that it feels cohesive with your brand. If your company is more creative and laid-back, try going for a more whimsical card design. If your company is more buttoned-up and professional, opt for a more decorative or classic holiday card. Even including the colors of your brand into the card design will make the card feel branded. Online design and printing services such as Minted, Paperless Post, or Shutterfly offer many unique holiday card designs for you to choose and often allow you to customize them by including specific colors, images, and text. With whatever design you choose, make sure it feels like it’s coming from you and your business specifically. If you’re planning to make a splash with a stand-out holiday gift, consider sending something unique and unexpected. Of course, sending cookies, chocolates, and other edible treats are a nice gesture that will never go unnoticed. But in order to stand out from all of the other holiday gifts that are being sent and received this season, take the time to plan and think outside of the box to put your own spin on a traditional holiday gift. 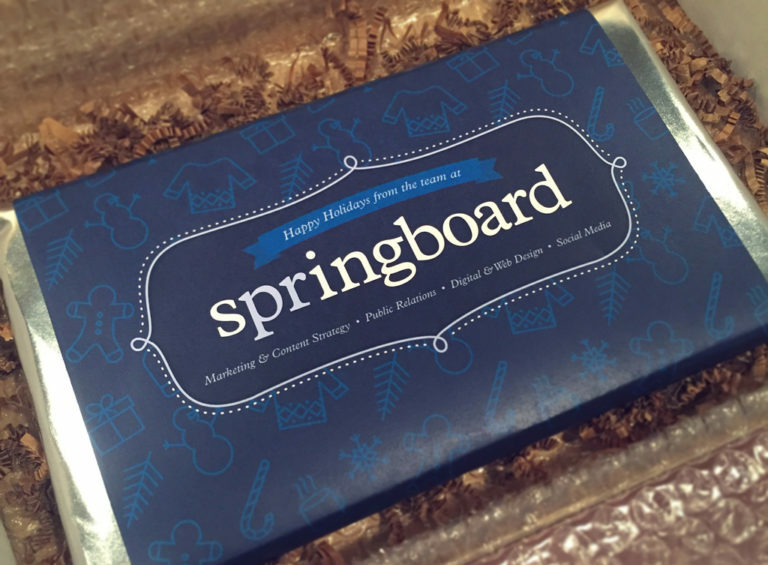 To illustrate this idea, a few years back, the Springboard team decided to send oversized one-pound chocolate bars to select clients with a custom-made wrapper. 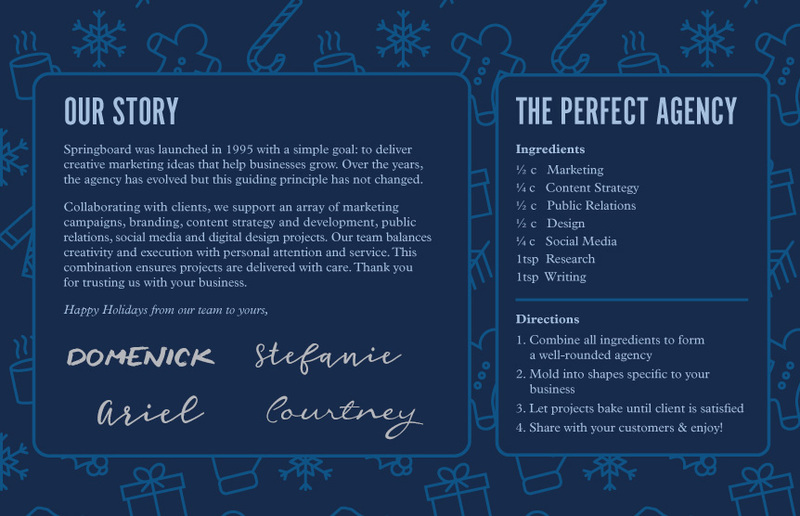 The packaging surrounding the chocolate bar showcased the different services we offer as well as a recipe for “The Perfect Agency,” which allowed us to be creative in our copywriting. As an added bonus, a select number of customers received a “golden ticket” coupon inside the chocolate wrapper that offered a discount on a future project. What could have simply been a generic holiday gift set of chocolates turned out to be a show-stopping gift that not only left an impression on our clients, but also showcased our clever creativity (pardon the shameless plug). So before you send out your holiday greetings this year, be sure to take the time to consider the possibilities of making an impact with a creative and thoughtful message.